I am currently blogging while stuck in traffic. I have been pretty busy this past week nawala na naman momentum ko sa pag bblog. Well, this future momma gotta work for the bebe!! Anyways, Iwhite Korea sent me samples of their BB Cream for me to try. Iwhite Korea is known for their affordable products housed in sachets. This BB Cream is no exception. Each sachet is split in 2 and has 4ml weight. One sachet is good for two usages. This only costs 24.50 pesos. Very cheap right? It is perfect for travel and will definitely not take too much space in your kit. I only wish that this BB Cream comes in a resealable packaging because I find the packaging messy to work with especially if this product is used sparingly. This BB cream is made of plant extracts and smells very yummy (reminds me of peaches). I do not know with other people but I really love the scent of this BB cream. This comes in two shades Light and Beige. The shade light is yellow based and suits my NC30 skintone. As for Beige, the shade is a bit darker than light and it has more of an olive tone to it. The BB cream has a watery texture and blends well. It feels lightweight and feels very very hydrating on the skin. It does work well with my very dry and sensitive skin. It evens out my skintone but it does not cover my redness and dark under eyes. As I mentioned, this BB Cream is very hydrating, thus, making it very dewy when worn. You may refer to the photo below to see how dewy this looks on my skin. Due to its moisturizing properties, this product tends to cake especially when it layered. My recommendation is used it sparingly and make sure to blend very well. It stays on for hours and works as great base underneath powder foundation. Overall, it is a good hydrating BB cream but I really wished this has spf in it (para bongga, pero choosy paba 24.50 nalang nga eh). 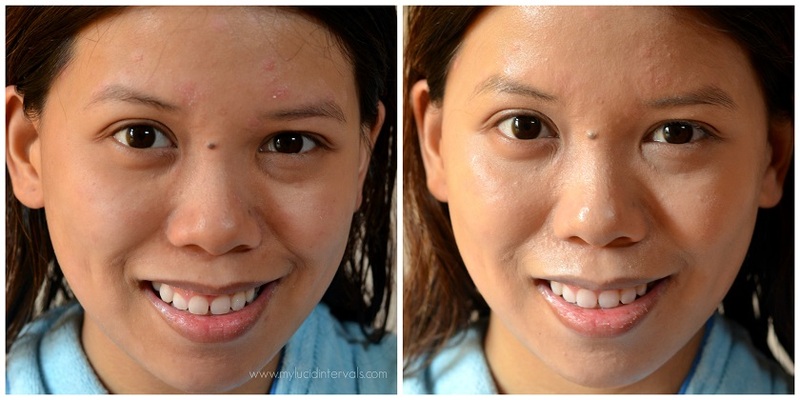 If peg niyo ang dewy skin, then you nay want to give this product a try. I recommend this to those with dry skin. Natry kp na yung ibang product ng Iwhite pero Di ko pa nattry yung BB Cream nila pero nakikita ko na to sa mga store like Watson.I have dry skin,matry ko nga minsan. I think this will not work for me kasi dewy finish. Baka mag mukha ako greasepan. Lol! But your photos are great. Which one did you put on in the photo? Tried the one in light. Did not work on my super oily skin though. Mukhang may oil slick mukha ko huhu. Also, medyo dark pa rin siya kahit light na. Huhu. Ms. D, do you have Korean BB Creams to suggest for oily skin? Glad to know and see that this "affordable drugstore makeups/skin care" are getting known or making names already. Tagal na rin sa market. Kudos to them at lumalawak na ranges nila. Facial wash pa lang na-try ko sa iwhite nun time na korean products are just starting to enter our local market.